The Bureau of Labor Statistics (BLS) released the Producer Price Indexes (PPI) for July. Inflation in prices received by producers (prior to sales to consumers) rose 0.2% in July after a 0.4% increase in June. The increase was based on rising prices for services (0.4%), prices for goods declined (-0.1%). Prices for both food and energy goods declined. Excluding food and energy goods, prices were flat in July after a 0.4% increase in June. Wood products prices batted in second consecutive monthly increases for softwood lumber and OSB. Softwood lumber prices rose 2.4% in July after a 1.0% increase in June. OSB price were up 1.0% after a 2.4% increase in June. Despite the increases softwood lumber and OSB prices are down for the year. Gypsum prices slid further in July, down 0.3% for the month, and 5.6% from a February peak. 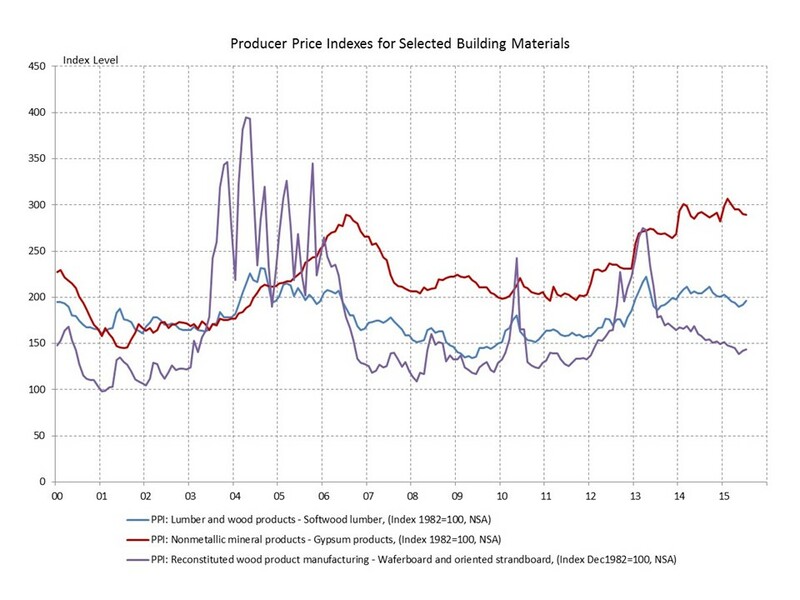 Despite the declines gypsum prices are on par with the housing boom peak.